I’m not really a perfect home kind of person, but there does come a point where charming tattiness tips over into grotty. We have two futons in our lounge, both old, but perfectly serviceable. The original covers on both were past their sell by date 10 years ago, so I bought some fabric from Ikea and just made a couple of throws. These throws are now very tired and I came up with the idea of making two new fitted covers for the futons. I could salvage the zips from the original covers and just whip them up this weekend…or so I thought. I started looking for fabric earlier this week and found some I really liked. When I measured up at home for the amount I needed, I realised the cost would be about £180. Once I would have just pulled out the credit card, but I stopped myself, counted to 10 and decided to look at other, more frugal options. making another set of throws either from remnant fabric or from some fabric I saw in a charity shop last week. I’m working hard on resisting the urge to splurge on fabric, because I don’t want to put things on my credit cards any more and I think there is a more frugal solution out there somewhere. I’ll let you know how I get on with finding it. How do you keep your furniture going? Have you ever re-upholstered anything? 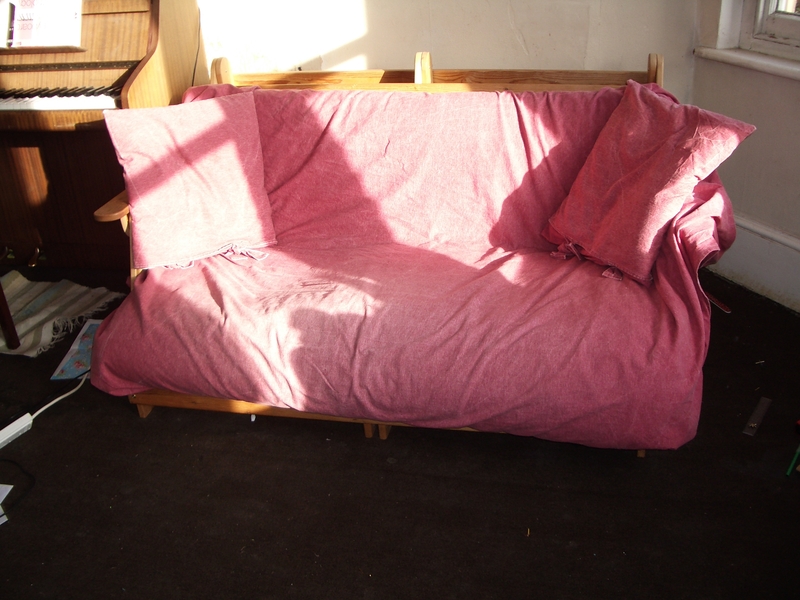 I made loose covers for my old sofa and an armchair and was very pleased with the result. The cotton material had been available in varying thicknesses and I chose the thickest to be hardwearing. Oh no – you would think that washing on a low temperature would be ok. I will watch out for that.